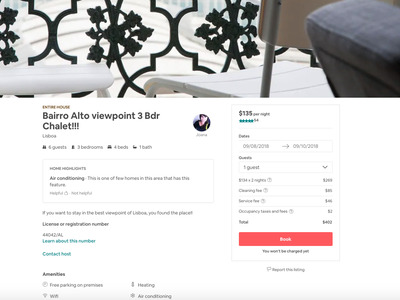 Home-rental service Airbnb is now directly competing with travel booking sites like Booking.com,Expedia, and others, as all of the sites have both traditional hotel listings and non-traditional apartment and home listings on their platforms. As the companies’ strategies for growth converge, I’ve observed that more and more rental listings can be found on multiple sites, often with wildly divergent pricing due to different fee structures and pricing algorithms. Save yourself a ton of money on your next vacation by cross-referencing listings that you want to book across multiple sites. I often found discrepancies of $US100 or more per night by checking listings between Airbnb, Booking.com, Expedia, and others. 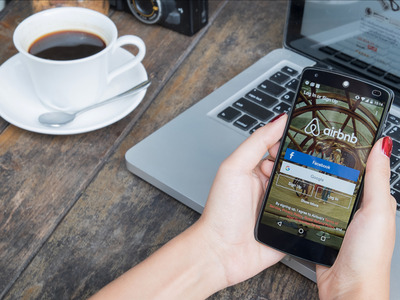 Earlier this year, Airbnb CEO Brian Chesky made clear what has been apparent to hosts and power-users of the popular home-rental service for some time: The company isn’t the only game in town anymore. 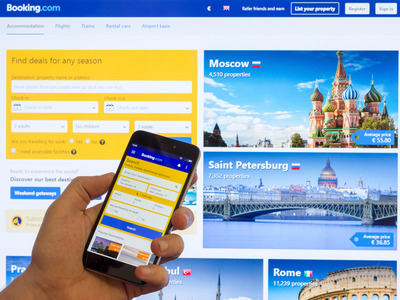 To put it simply, travel booking sites like Booking.com are in a race to become more like Airbnb, while Airbnb is making a run to be more like those sites. 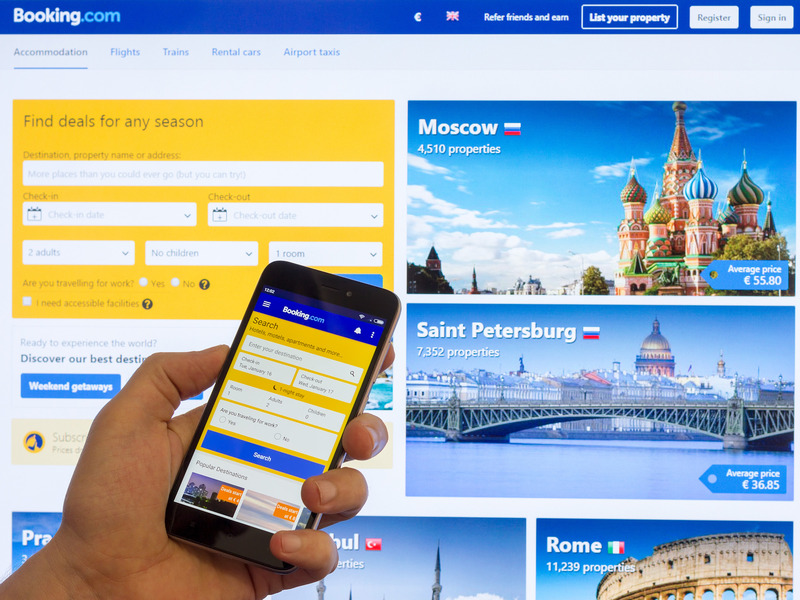 Booking.com announced in April that is now has 5 million non-hotel properties on its platform, including houses and apartments, a 27% jump from 2017. When you include hotels and traditional listings, Booking.com says it has 27 million listings total. Meanwhile, an Airbnb source told travel news site Skift that the company has up to 4.85 million listings, up from 4.5 million in 2017 and with plans to grow to 5 million in the near future. That follows the company’s announcement in February that it was adding hotels to the platform. As the two services converge in their offerings, more and more listings can be found on both Airbnb and Booking.com. And, from my experience, identical listings often have wildly different pricings depending on the platform. There are likely multiple reasons for the price discrepancies. The sites charge different commission fees to hosts/hotels/etc on the platform, as well as different fee structures to the guest booking. In addition, Airbnb has a “Smart Pricing” feature that hosts can use to automatically raise or lower prices based on demand. 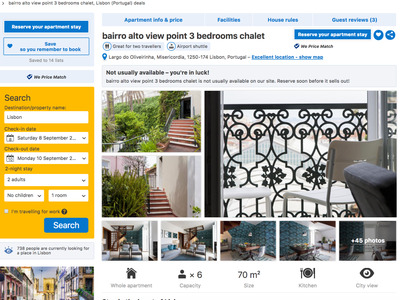 Meanwhile, Booking.com has its RateIntelligence feature, which helps properties optimise their pricing. Each platform’s tool obviously uses its own algorithm, which likely results in some of the price discrepancies. Long story short, when you find a property that you’d like to rent on one platform, do yourself a favour and find the property on competing platforms. It’s likely that the price will be considerably cheaper on one platform or the other. In my experience, I’ve found that Airbnb tends to be the most expensive platform for the end-user, because it adds on a cleaning fee, a service fee, and occupancy taxes after the fact, where Booking.com usually includes it in the price. This is pure speculation, but I believe this has to do with user expectations. Airbnb users are conditioned to view Airbnb as a peer-to-peer service, rather than a straightforward consumer site. As such, they are more willing to accept a cleaning fee after the fact, viewing that as a cost he or she should bear, rather than the host. Meanwhile, Booking.com users are expecting a hotel booking site, where everything is already included. For example, this apartment in Jerusalem, Israel, listed as Royal Market Palace Apartments on Booking.com, goes for $US317 for six people from September 3 to September 5. Meanwhile, a seemingly identical apartment on Airbnb goes for $US385 over the same period. A nearby two-bedroom apartment for five people at Windows of Jerusalem goes for $US404 on Airbnb and $US386 on Booking.com. Which is cheaper depends on the property, the location, and the dates. 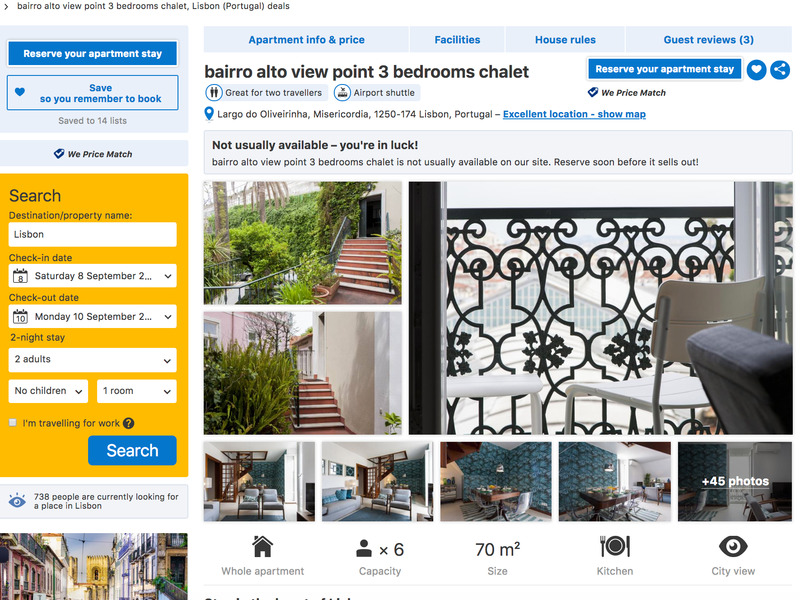 For example, this Bairro Alto 3-bedroom apartment in Lisbon, Portugal is listed for $US402 on Airbnb for September 8 to September 10, while it goes for as much $US731 on Booking.com. One interesting wrinkle, I noticed: Airbnb often does not charge you for using the full occupancy of an apartment, whereas Booking.com almost always charges based on how many people will be in the property. So if you are travelling with more people, you’ll probably save money by using Airbnb. I’m sure you could do this with thousands of listings in just about any city in which both platforms operate, as well on other platforms like HomeAway, VRBO, or Expedia. Increasingly, property owners/hotel operators/small business owners/hosts (whatever you want to call them) are listing on multiple sites. The Airbnb source told Skift that 3.5 million of its listings, or 72%, are exclusive to Airbnb. But I’m not buying that number until I see the company announce it officially. My suspicion is that, even if the number of exclusive listings is that high, that number is going to go down over time. It simply doesn’t make sense for business owners – Airbnb calls them hosts, but let’s be honest, they increasingly resemble small businesses – to list their property on one marketplace, particularly as competition gets more fierce with the addition of boutique hotels and bed & breakfasts to Airbnb’s platform. While Airbnb currently leads Booking.com in web traffic in the US, Booking.com has the lead globally, according to SimilarWeb report released in June. Whether that will continue to bear out as competition intensifies is anyone’s guess. In the mean time, take advantage of the competition by checking prices across platforms.